Teaching technique to dancers is, for the most part, straightforward. Regardless of the style—"standing leg in plié," "transfer your weight" or "find a low contracting lunge"—the cues become second nature for teachers and students. But articulating emotion and passion can be a struggle for teachers and even uncomfortable for some dancers to grasp and execute. While some kids naturally connect emotion to their movement, (i.e. the inspiring clip below), not every group of young dancers will have the zest and mature enthusiasm to move the audience or competition judges to stand up and cheer. So how do you teach a dancer to emote? If you're having trouble pulling the passion out of your students, here are a few ideas to help them find "the feeling" in their dancing. Choreographer Darrell Grand Moultrie strives to teach his students from a young age to understand musicality and dancing with passion. As a young dancer, he had a teacher who used soul and gospel music in class to pull emotion out of dancers, and he's stuck with this method in his own teaching. "When you want young dancers to feel, using soulful vocals and music are like an instant shot and win," says Moultrie. Here's a video from a class at The Debbie Allen Dance Academy in Los Angeles of a group of young kids dancing with maturity far beyond their years. "Everyone relates to a song or a concept differently," says Tiffany Prout-Leitao, owner of Center Stage Dance Academy. "I have students come up with their own story, so it's organic and not fake or forced. I have them listen to the song, close their eyes and not dance but see their movement and let the natural feeling come out." Kelby Brown, who's taught for American Ballet Theatre and at conventions like The PULSE, takes a similar approach. "To begin with, I always ask dancers to listen to their music without dancing. Just truly listen," says Brown. 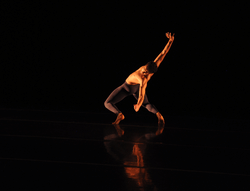 He asks students to create a guide for the choreography, what he calls an emotional outline, by choosing three adjectives to describe the music. This encourages dancers to consider their senses and how those details affect the movement—visualize the space, what it smells like, what their relationship is to the other dancers or themselves, whether it's a solo and whether they're moving through a material like mud or water. "These are all tools that young dancers need to gather, so they can have confidence in their portrayal of whatever emotion they're trying to get across to the audience," says Brown. "If you don't feel something, then the audience won't, either," he adds. "It's our job as dancers to create that experience."